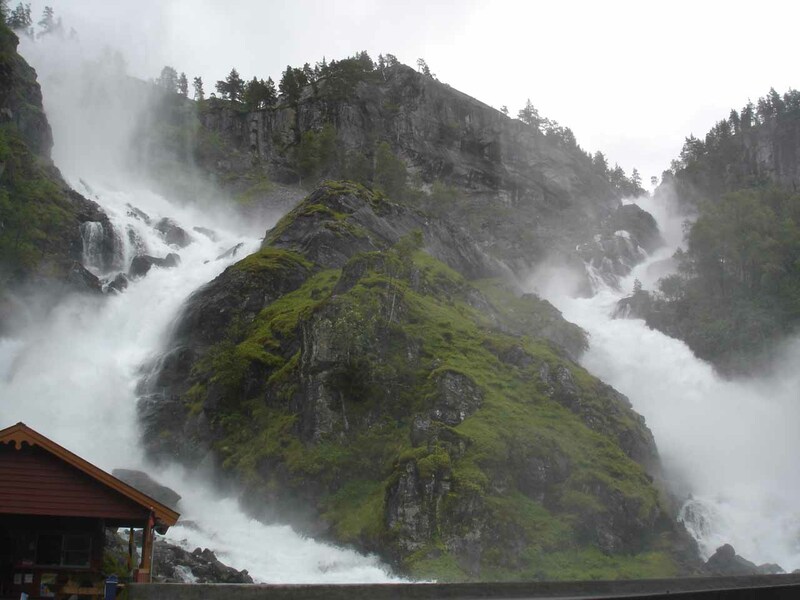 Latefossen (Låtefossen [maybe pronounced like “LOH-teh-foss-un”]; also seen it spelled Lotefossen) was probably the most popular and dramatic of the waterfalls in Oddadalen (the Odda Valley). 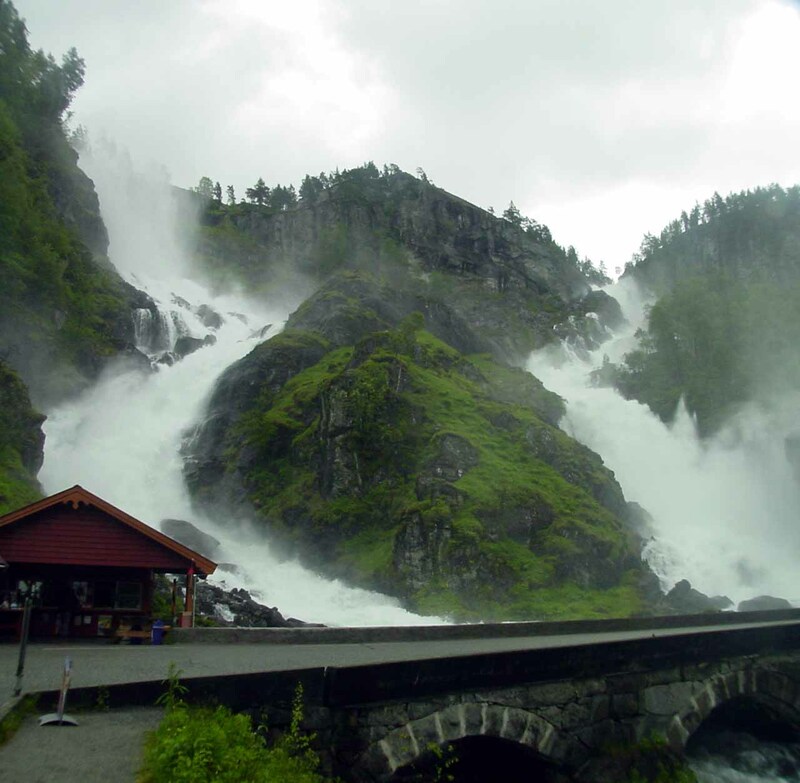 Although we thought almost all of the waterfalls we encountered in the waterfall-laced Oddadalen were spectacular, I guess this one got the notoriety given its dual cascade appearance each with high volume flow. We had a difficult time trying to keep our camera lens dry while attempting to take a clean all-encompassing photo of it given the nearly constant mist being thrown in our direction. And this was the case despite the fact at that we were standing besides the car park on the opposite of the bridge (said to be completed in 1859) a little downstream of the base of the falls! 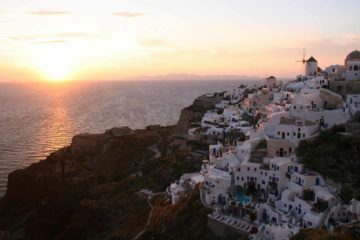 The photo shown above was probably our best effort. The signs here indicated that the pair of waterfalls tumbled from a height of 165m. 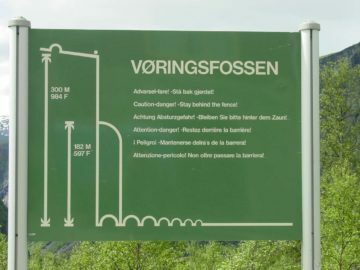 That said, I’ve also seen that its maximum vertical drop was said to be 51m, which I found the conflicting numbers to be confusing. 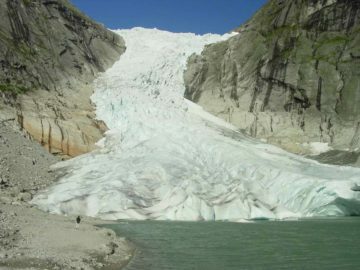 The forceful flow came from the lake Lotevatnet (Låtevatnet), which itself drained much larger lakes and snow fields. 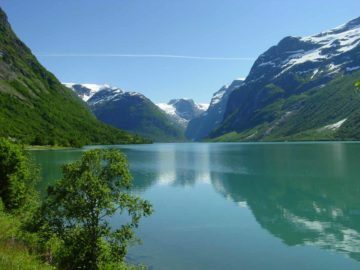 Among these lakes include Reisnosvatnet in the highlands of the vast Hardanger Plateau or Hardangervidda. 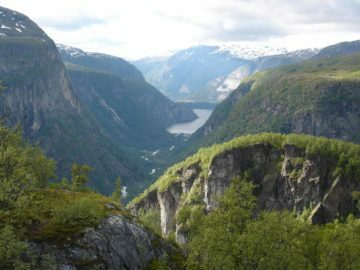 Hardangervidda is said to be Europe’s largest mountain plateau. The falls was also said to be part of the protected Opo Watershed so its year-round flow and existence was assured. 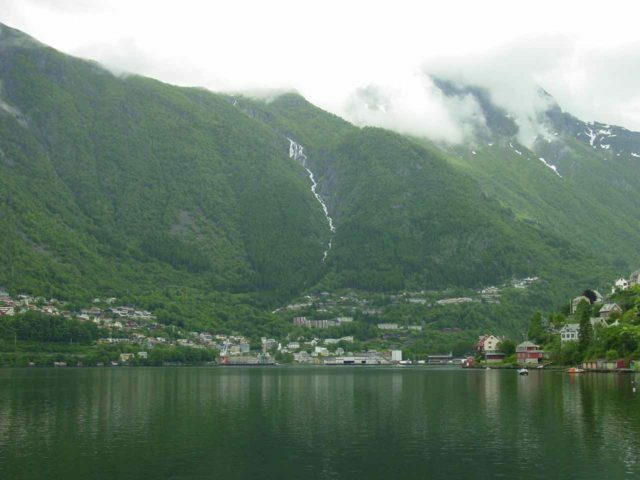 By the way, this protected watershed also allowed Oddadal Valley’s numerous other waterfalls to persist as well. 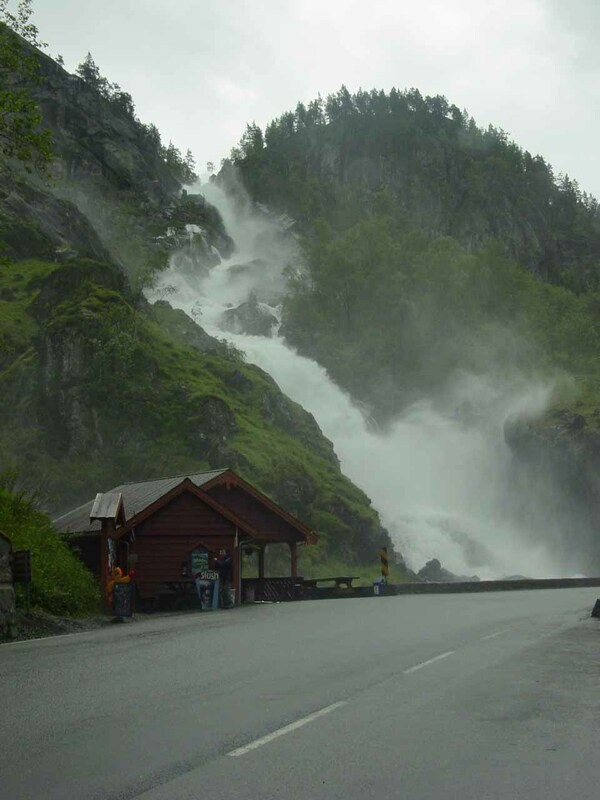 Also according to our Adventure Roads in Norway book , the more southern waterfall of the pair was technically supposed to have a different name called Skarsfossen. 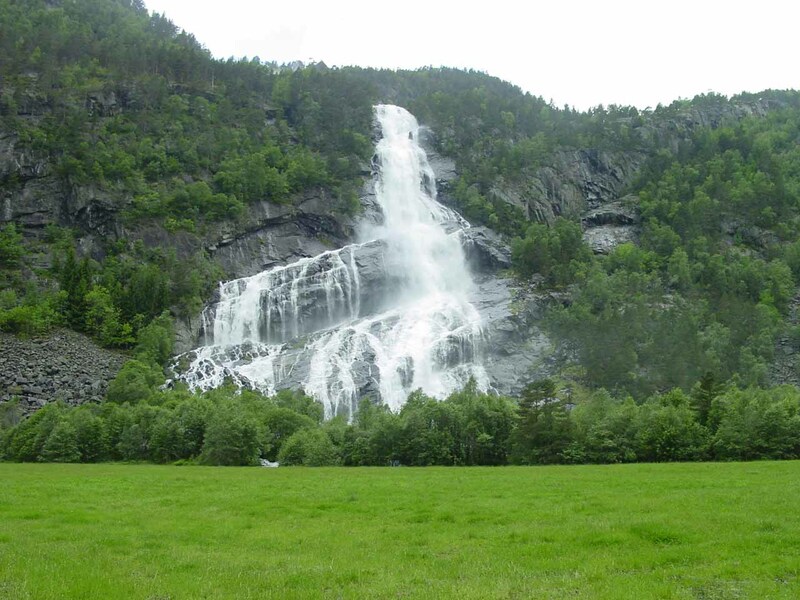 Meanwhile, the more northern waterfall was supposed to have the name Låtefossen. 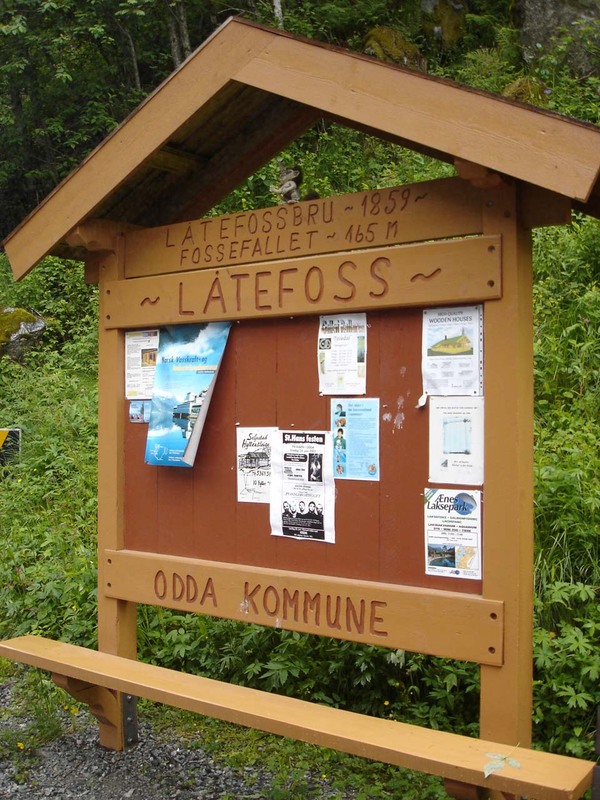 Regardless, I tend to think of the two waterfalls together as Låtefossen, and I believe the literature agrees with this naming convention. It was definitely busy at the falls during our June 2005 visit despite the threatening weather. They had put a little car park area, which seemed kind of small for the amount of traffic (at least when we were there). We had to queue up a little before we found a spot, but somehow the infrastructure here seemed to be strangely sufficient at the time. Speaking of infrastructure, there was also a snack bar as well as the aforementioned signs containing some advertisements as well as a few words about the falls. 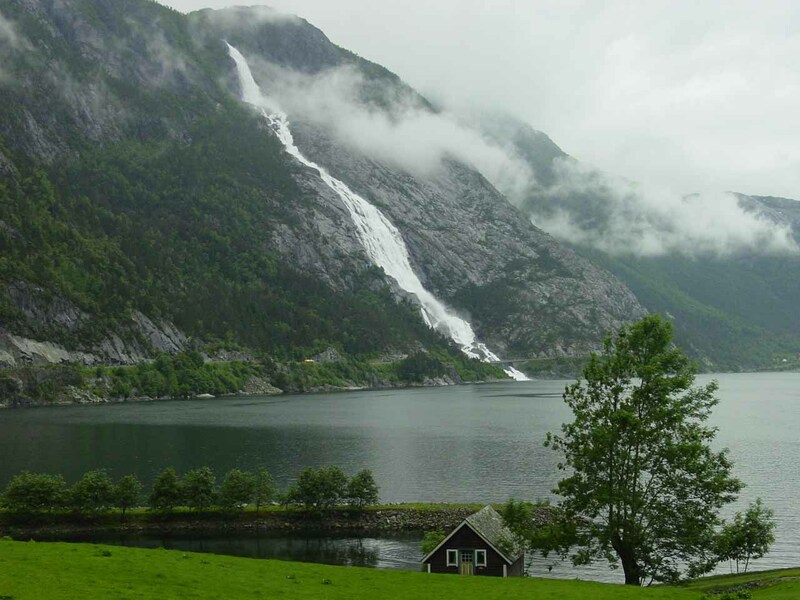 Latefossen resides in the Odda Municipality. For information or inquiries about the area as well as current conditions, visit their website or Facebook page. 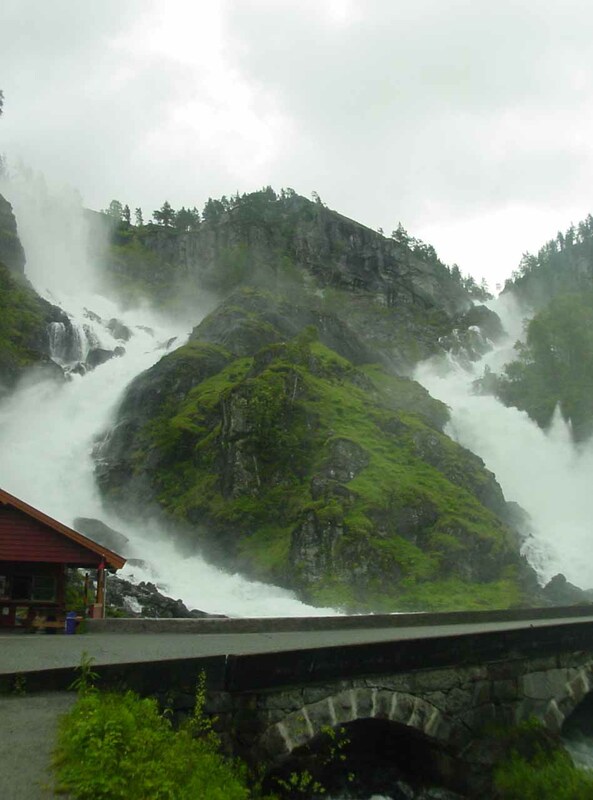 Latefossen is on the southern part of Odda Valley (aka the Valley of Waterfalls) along the Rv13 about 15km south of Odda and 3km north of the E134/Rv13 junction by Skare. 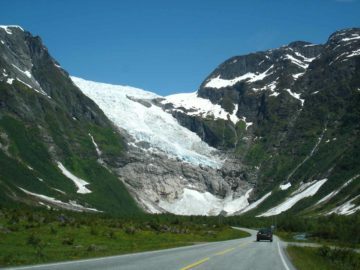 It’s about 350m north of Espelandsfossen and roughly 7km south of Vidfoss.